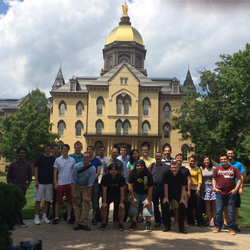 The second Heidelberg-Notre Dame Summer School in Computational Chemistry took place at the University of Notre Dame from July 4 to 10, following its launch in Heidelberg last summer. Complementing the first summer school focused on quantum mechanical methods, the second summer school covered the fundamentals and applications of classical force field methods in many areas of chemistry. Twenty-four students and eight faculty members from the University of Heidelberg and the University of Notre Dame participated, exploring topics involving the basics of statistical methods and force fields. Faculty members, including co-organizers John Parkhill and Olaf Wiest, propelled this exploration with lecture, discussion, and tutorial components. The summer school in computational chemistry is part of a larger collaboration between Heidelberg and Notre Dame that includes exchange of graduate and undergraduate students, mini-symposia and faculty visits, as well as joint research projects. The next summer school will take place in Heidelberg in the summer of 2017. Funding for this year’s program was provided by the Global Collaborative Initiative International Research Funding program administered through Notre Dame International. Originally published by Rachel Miro at science.nd.edu on August 08, 2016.